#88: Are Ride-Share Apps Hurting Public Transit? Are ride-share apps like Uber and Lyft hurting New York City's public transit? Learn about the latest data on Simon's final Economic Snapshot podcast as our host. 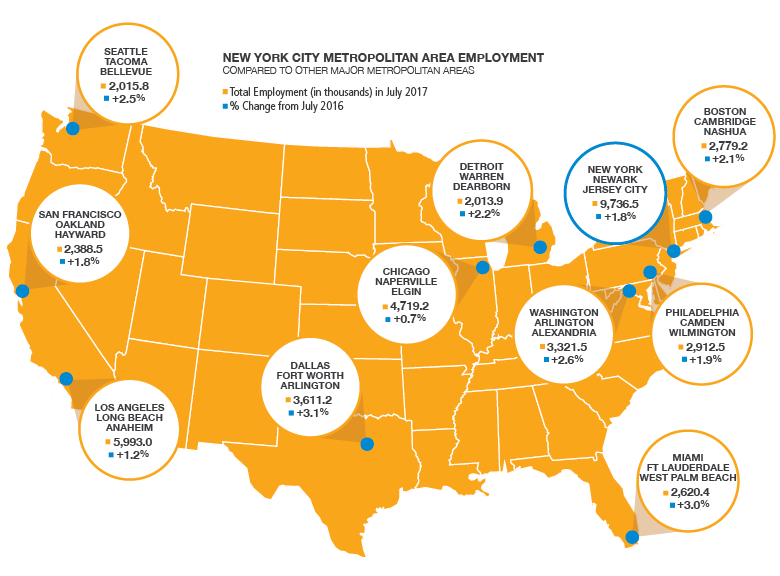 Private sector employment in New York City fell moderately in August 2017 after three months of above-average growth. A 3,900-job decline follows last month’s gain of 8,800 jobs, which was revised down from 15,500. Over the last twelve months, the number of private sector jobs has grown by 89,900, up 2.4% from last year. Accommodation and Food Services and Arts, Entertainment, and Recreation led job growth, each adding 1,300 jobs. Losses were concentrated in the Retail, Health Care and Social Assistance, and Real Estate sectors, each losing more than 2,000 jobs. Private sector educational services also saw job losses, and will be discussed in depth on the Industry Snapshot. The unemployment rate continues its steady uptick, reaching 4.9% in August 2017, from 4.7% in July. The US unemployment rate was 4.4%. The New York City unemployment rate remains below the level of this time last year, when it was 5.4%. Labor force participation rate fell 0.2 percentage points, to 61.4%, between July and August 2017. The rate remains near record highs; July’s rate was the highest figure recorded since the series began in 1976. For the first time since November 2016, average hourly wages dropped from prior-year levels. Hourly wages hit $34.67 in August 2017, down 0.8% from last year. Average hours worked also fell, reaching 34.2 hours per week, from 34.4 last year. As a result, average weekly earnings fell 1.4% from August 2016. This dip comes after consistent wage gains throughout 2017. Educational Services, a sector encompassing public and private education from kindergarten through professional certifications, is in a major expansion. Between August 2016 and August 2017, private employment in the sector grew 8.6%—by far the fastest rate of growth of New York City’s major industrial sectors.1 While the sector dipped slightly last month (down 1,300 to 269,200), much of this growth has come in the last several months, with employment rising by 23,100 jobs, or 9.4%, since April 2017.2 Over the last five years, growth in the sector has been led by private employers. Employment at these institutions grew 14.8% between 2012 and 2016, while public educational employers added 1.4% more workers. Major shifts are taking place within this growing sector, with increasing employment concentration in advanced education. Between 2012 and 2016, job growth was led by Other Schools and Instruction, which employs 23,000 workers in schools of fine arts, sports and recreation, language, and other specialized instruction, and by Colleges and Universities, which employs 98,500 workers. Jobs losses were overwhelmingly concentrated in two relatively small subsectors, Junior Colleges, which includes community colleges and employs 4,000 people, and Educational Support Services, which includes educational-related consulting and counseling and employs 8,600. Meanwhile, Elementary and Secondary Schools, the largest subsector, with 202,600 workers, has seen employment fall over the last five years. This decline occurred primarily between 2014 and 2015, when the subsector’s employment fell 7.2%. NYCEDC monitors New York City’s gross city product, venture capital financing, and data from the New York Federal Reserve Bank, each of which is reported on a quarterly basis. This month, we are reporting the New York Federal Reserve Bank’s Index of Coincident Economic Indicators. The Index of Coincident Economic Indicators is used by the New York Federal Reserve to capture economic activity in a single index, and is constructed from four data series: payroll employment, unemployment rate, average weekly hours worked in manufacturing, and inflation-adjusted earnings. 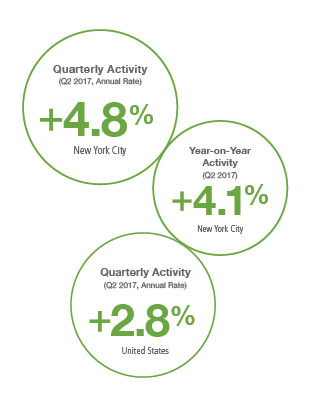 Economic activity continued to accelerate in New York City in the second quarter of 2017, according to an index maintained by the New York Federal Reserve Bank (see note above). This marks the fourth consecutive quarter in which New York City’s rate of economic expansion has increased from the prior quarter, and the fastest rate since the fourth quarter of 2015. Economic growth also rose for the US as a whole, rising 0.4 percentage points to 2.8%. Unlike New York, however, this rate is below 2016 averages. Average rent prices in New York City rose 0.8% from the same time last year, to $2,350. This is the City’s first year-over-year rent increase since October 2016. The preceding nine months had seen modest rent drops from the prior year. August’s rent rise remains well below 2016’s average increase of 3.0%. 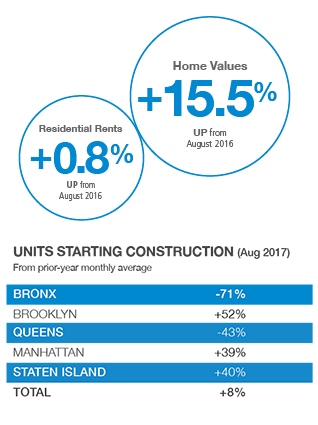 While home values continue rising sharply, the rate of increase has leveled off. Average home values rose 15.5% between August 2016 and August 2017; last month that rate was 15.8%. The number of residential units starting construction in August 2017 rose slightly from the twelve-month average ending in July 2017. This increase was led by Brooklyn, where work began on 82 residential construction projects containing a collective 997 units, the most units since January 2017. The New York City office market softened in the second quarter of 2017. In Manhattan, net absorption—the change in occupied space over the quarter—was negative 628,900 square feet, while vacancy rose 0.1 percentage point from last quarter, to 8.2%. Two buildings adding just under 250,000 square feet were added to Manhattan’s office supply over this time. Average rents fell to $59.93 per square foot, down 8.4% from the first quarter of 2017. Vacancy and rent decreases were led by Class A buildings—the top tier of office space. 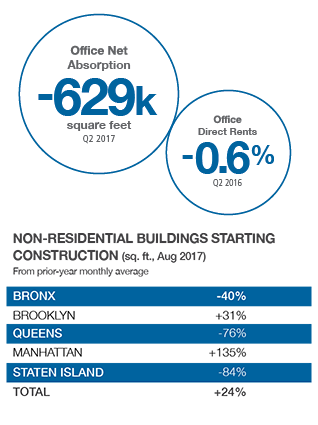 Similar trends were apparent in boroughs outside Manhattan, where net absorption was negative 308,900, and vacancy rose from 6.6% to 7.3% between the first and second quarters of 2017. Average rents fell 7.7% from last quarter, to $32.37 per square foot. Non-residential buildings starting construction in August 2017 saw a boost compared with averages over the preceding twelve months. This increase was almost entirely due to a surge of construction in Manhattan. The borough saw construction start on 45 non-residential projects totaling 1.6 million square feet. Half of that square footage is attributable to the Moynihan Train Hall, a key part of the revamped Penn Station. The New York City tourism sector expanded at a brisk pace in July 2017. Led by international travel, airport passenger traffic grew 5.2% from the prior year, the fastest pace since January 2017. Broadway revenue also continued rising sharply from last year, attributable largely to higher ticket prices. Hotel room rates and occupancy fell slightly from last year. This is largely the result of a fast-rising supply of new hotel rooms; the number of hotel room nights sold in May 2017 rose by 86,000 to 3.1 million. Public transit ridership, meanwhile, continued declining. Ridership on New York City Transit was 2.6% lower in July 2017 than the prior year, which is an average rate of decline for the last twelve months. Commuter rail ridership also aligned with trends over the last twelve months, remaining essentially unchanged from July 2016. 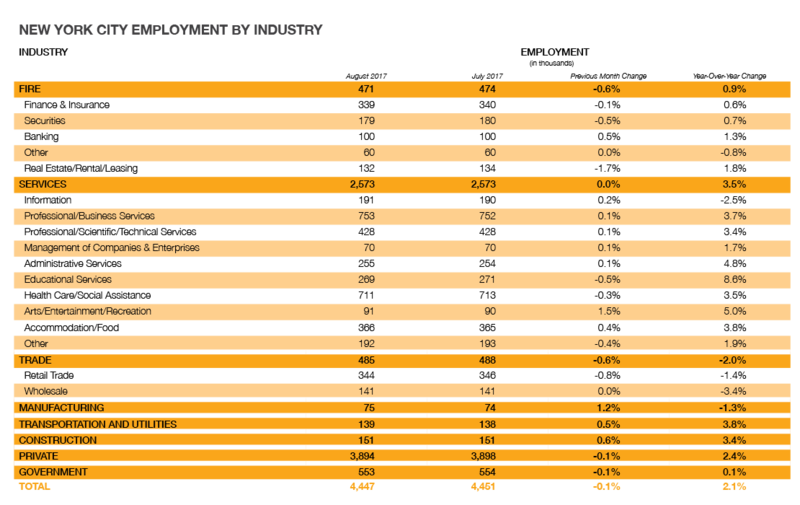 Only automotive traffic showed an increasing rate of change from last year. Sources: Port Authority or New York and New Jersey; Metropolitan Transportation Authority; Broadway League; CBRE. *Note: Airport and Broadway data are reported for July 2017. Hotel data is reported for May 2017.